APT's Construction division has expanded its services to cater for Tight Access Excavation Hire. 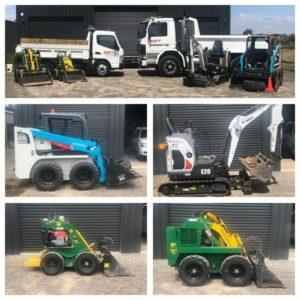 We are able to cater for all types of tight access excavation services such as Levelling, Soil Removal, Concrete Removal, Site Cuts, Rubbish Removal/Site Cleans, Strip Footings, Foundations & 3t & 8t Tipper Hire, all with experienced operators. for all enquiries regarding excavation. Contact Nicholas on Mob: 0431758360 or email: nicholas@aptconstructiongroup.com.au for a free quote. As it comes to the time of year where people take breaks from work and spend more time with their families, or more relaxed time around the home, it’s generally the time where you start to think about your plans for the new year. That extension to your home might enter your mind again because you’re tired of not being able to comfortably entertain your guests, or you may reconsider your options for building a new home because you’re sick of hearing your kids argue in their shared bedrooms… or simply because you’re growing out of your home. Whatever it may be, BEFORE you make the call on what it is you want to do, we can’t stress enough that you know your BUDGET. Know what it is you have to spend BEFORE meeting with your designer or builder. You don’t want to go through the whole process of designing something that looks great, it’s big, it’s got all that you ‘want’ and then get to the building stage and your quotes are coming back as figures way out of your budget. Not only is that a waste of time and money, but it’s going to cost more again in redesigning. You also don’t want to go to your designer or builder with your absolute maximum figure that you’ve got to spend. Be reasonable and safe. Understand that sometimes unexpected construction costs may arise (especially in extensions due to findings upon commencement of works), or you may REALLY want that Caesar stone benchtop when you thought you’d be ok settling on Laminex. Leave yourself some room for play if need be, don’t max yourself out upon the acceptance of a building quote (and be weary of hidden costs with some builders – especially in the base/slab stage). It’s important that you feel comfortable with your designer. You want to be able to ask all the questions you may think are silly, but in actual fact are questions that are putting you at ease about where you’re spending your money. It’s also important that your designer has an understanding of these four things: 1. Your budget 2. Your needs 3. Your lifestyle 4. Your wants. Upon meeting with your designer, these are the four things that are important to cover to ensure you’re wasting minimal time on going back and forth with the design (time is money) and that the design meets your brief. The reason ‘Your wants’ is number 4 is because the designer will work with your budget to first suit your ‘needs’ for your ‘lifestyle’ according to your ‘budget’ and then can incorporate the ‘wants’ if there is allowance for it. As designers and builders, we like to offer an estimate budget quotation for the construction works at the preliminary design stage before finalising the architectural working drawings. It’s only an estimate as until final design elements are completed ie. engineering, soil test reports, energy rating reports, client specifications etc., a firm quotation cannot be given. In saying that, we like to tell our clients to allow approximately 10-20% from the budget price as a guide so they can do their rough calculations according to the preliminary design before taking things further. Therefore, before doing anything, know how much money you’ve got to work with. There’s no point spending money on designs that are out of your reach then having to rework and rework designs until they are anywhere near your budget. Make sure you and your designer are on the same page and, finally, look at getting an estimate construction quote prior to finalizing your design and architectural drawings. ARE YOU CONSIDERING BUYING A RESIDENTIAL BUILDING ALLOTMENT? Contour of Land: a) Contour of land in general terms means the fall in the land. Does it fall to the front, rear or side to side? Falls in land can have effect on what you wish to build especially if you want to build to the boundary, as there is a max height of 3.2m on the boundary b) Also large falls/slopes on land can cost you extra when it comes to site costs. Orientation of lot: a) Always consider the direction of north on the lot and ensure it will work with the style of home you want to build. Ideally, good designs will have the living areas windows facing to the northerly direction to have a more energy efficient home. Ideally, lots that have north direction to the sides of the allotment or to the rear of the property will be better suited to your standard designs. Easements: a) Easements are usually set aside for sewerage and drainage mostly, but sometimes you come across easements that contain gas and sometimes power; these are not as common. Always be aware of easements as you cannot build over them. In some cases you are permitted to build garages over them with special permission (this needs to be applied for). Also, keep in mind that when building close to easements or over easements with garage, you will incur additional costs when it comes to foundations (the deeper the services in the easement, the greater the cost to your foundations pending the distance from the services). Therefore, always be aware of easements and ensure they will work with your proposed design ideas. Specific design guidelines and body corporate fees: a) Many new subdivisions these days have specific design guidelines that need to be adhered to and in most cases require developer approval of your design before you can submit for building permits. Always ensure that you read these conditions and understand how they will affect the style type and home you wish to build (if in doubt, seek some professional advice from your building designer). b) There are the occasional subdivision these days that have a body corporate attached to them which incurs an additional fee that you are required to pay on top of your standard council rates. Soil conditions: a) This is the big one. Soil conditions can really affect your site costs; especially in relation to the type of foundation that will be required based on the soil conditions. As a designer and builder I would suggest that you always obtain a soil test report to attain the soil condition of the lot prior to purchase, that way you eliminate any surprises. The average person will not really be familiar with the soil test results, so therefore I suggest you discuss it with your designer or builder for professional advice. The average person will not really be familiar with the soil test results; therefore I suggest you discuss it with your designer or builder for professional advice. In general, my advice to you would be to seek some professional advice from a professional building designer, building consultant or drafting service provider prior to placing your deposit. Here at APT Design, Drafting & Construction PL we can provide you with all the professional advice you require prior to your purchase to ensure you have all the facts and make the right purchase to suit your requirements. Once you have made your purchase we can assist with all your design requirements through to obtaining permits. All works guaranteed. Hopefully these tips help when next looking to make a purchase. By now, most of you would be aware of the latest drop in interest rate and also be familiar with the budget released last week. There seems to be a lot of positive feeling about at the moment in relation to the property market, which is great. The average home owner is now considering spending money on their existing home, looking at upgrading to a new home or even purchasing an investment property (let’s be frank, money in the bank is not earning you much at all at the moment). Keeping in mind that the property market is a very good investment and with interest rates at their current low, it is starting to entice more and more people to invest in property, which in turn will force prices to rise… so don’t be left behind! So, having said that, now would be the time to act and get that extension, renovation or new home that you have always dreamt of. If you have already done the above and you’re in a comfortable enough position and ready to invest, why not think ahead for yourself or your family by searching for a new investment property, as who knows what the price of housing will be like in 20-30 years’ time and your children will need all the help they can get. Another option, if your current property is very down and needs a lot of work, may be to consider redeveloping your property as a dual occupancy or multi-unit development. Many people over the years have become wealthy just by investing in the property market. Basically, it is a very good time to consider making the move if it is something you have been contemplating and take advantage of the interest rate drop. Here at A.P.T. Design, Drafting & Construction P/L we would be happy to discuss any ideas you have in relation to extending and renovating your home, knocking down existing & rebuilding, or even building from scratch on a new block of land. We also specialise in obtaining planning permits for dual occupancies and multi-unit developments. We like to make it easy for our clients as we cater for all needs under the one roof. Feel free to contact us for a no obligation consultation to see what we can offer you in relation to your property and investment ideas. We’d be pleased to share with you our wealth of experience. Don’t hesitate to give us a call or drop us an email. When purchasing your investment property: Tip 1 – Good foundations. Inspect expansion joints to see if gap is consistent. If gap at bottom is eg. 10mm and at top say 40mm then this is generally a sign that there is foundation movement. Check if stumps are timber or concrete (if timber, it’s almost a guarantee that it will need restumping in the not too distant future). If you look along the walls down the length of the weatherboards, you can generally tell if the house has moved. If the weatherboards drop at ends or are like a speed hump this is a good indication that the house is out of level. Also refer to items iv, v and vi of ‘Brick Veneer Homes’ as this will also apply. Generally your investment will provide you a larger cost saving in the long term if you have a good solid foundation to start with. This is just some basic knowledge about foundations, but when making such a large investment it always pays to have an expert inspect the property prior to purchasing. Stay tuned next week for Tip 2.